Brazil's current account surplus hit a record level in July, indicating that exports are growing strongly. The surplus was $3.04bn (£1.6bn) in July, more than many analysts had forecast, the central bank said. Brazil will be holding elections on 1 October and the state of the economy is expected to be one of the main factors that will sway voters. While exports are performing well, there are concerns about the rate of Brazil's economic growth. Although growth has picked up, many observers complain that it should be even quicker still. Thursday's current account figures, which count the value of Brazil's total trade, services and currency inflows, could help to ease some concerns. According to the central bank, the current account surplus in the 12 months to the end of July was 1.45% of gross domestic product (GDP). Foreign direct investment was $1.6bn in July, compared with $1.06bn in the previous month. 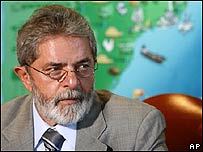 In the lead up to the polls, President Luiz Inacio Lula da Silva is expected to focus on his economic successes, especially after his political party was caught up in a corruption scandal last year. Brazilians will elect a president, state governors, and members of Congress in October.